Today, you are going to LOVE, LOVE, LOVE the FREEBIE and tap light idea on this post! Michelle has a lot of experience and has been so kind to share with all of us! Thanks, Michelle! Please be sure to follow her if you like what you see. She would love to hear how you like her post! Happy Reading! Hi "Creative Classroom" friends! I am so happy to be sharing some FREE stuff today! My name is Michelle and you can find me over at No Monkey Business...Just Bunches of Learning blog. I'm a 22 year teaching veteran that's taught everything K-3rd. Until very recently, I was a third grade teacher and perfectly content! 48 hours later I was in a Literacy Coach position. Luckily, it was in the SAME SCHOOL. So I can't even begin to tell you how supportive my staff has been and how blessed I feel to be where I am! Change is difficult, but sometimes a good thing. It seems funny that my title is "Literacy coach," because I plan to share a MATH lesson with you all. Hmmm...You can take the teacher out of the classroom, but you can't take the classroom out of the teacher, huh?! With our teachers currently diving into place value, I thought I'd share a FUN, MOTIVATING math lesson with you that your students are sure to enjoy. I always like to keep my students up and moving. I think they are more relaxed, carry on valuable conversations with each other, and it makes learning fun. This activity is no exception AND it's EASY to make! First, create some grids with a variety of different digits in them. (see photo) I had a parent volunteer make about 8 different boards on simple butcher paper and laminate. Divide your students into small groups. Find an item that will be easy to toss, but not roll. (small blocks, pennies (they don't typically roll, but land flat), small discs, etc.) Students toss the same number of blocks onto the board as the place value they're currently working on. For example, if their focus is on hundreds, then the students will toss 3 blocks. If they're working on thousands, then they will toss 4 blocks. Each student stands x amount of feet back from the board (4-5 works well) and tosses their blocks. 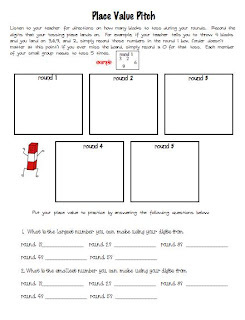 If thousands is the focus, the student records their four numbers in Round 1 of their Place Value Pitch answer sheets. Play until everyone gets through 5 rounds and comes up with 5 sets of digits. The next step is to manipulate the digits according to what the directions say on the Place Value Pitch sheet. (make the largest number you can, smallest number, sequence the numbers greatest to least, least to greatest, what is the value of the digit in the tens place, AND MANY MORE). The record sheet even challenges students to create a question of their own where someone would have to use their place value skills to solve. Students are doing math, but also required to think, write, create, and even share. Need differentiation? Sure thing!! This can take place in your small groups. One group might be focusing on hundreds, while another group is practicing the ten thousands place. 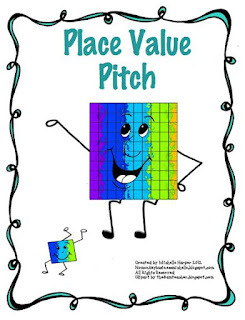 The place value pitch game is a FREEBIE available in my TpT store! So be sure to grab it! The images will get you to the link! Another variation of this game that I play is called Bulls-eye. It can also be played in cooperative groups, but is SMALLER in size and can be played at students' desks. I have the Bulls-eye Place Value game also available in my TpT store. Although similar, they are different enough that my students LOVE and beg to play both! They get to experience some hands on, interactive, and fun ways to practice this necessary Common Core skill. The record sheets hold them accountable for staying on task and communicating their progress with me. 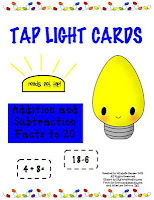 Looking for another fun Math freebie or two? I fell in LOVE with the Tap Lights this summer. I visited stalked my local Dollar Store until I got enough to outfit many cooperative groups! They have a "game show" kind of feel for reviewing some basic math facts. Turn over a card, be the first to "tap" your light to come on, and answer the question correctly! The tap lights come in a variety of adorable shapes too! (moon, heart, etc.) Warning: Your students will ask over and over for these to come out! I'm so appreciative of Leanne letting me hang out on her blog today! I hope you, her readers, have been able to take something FUN and ENGAGING back to your classroom. You can find me at No Monkey Business! Come by to say hi and/or let me know how the "Place Value Pitch" or Tap Light activity goes in your classroom! Cute blog! I'm glad I found it via Michelle's blog. I’d love it if you wanted to come on over for a visit sometime. Thanks!